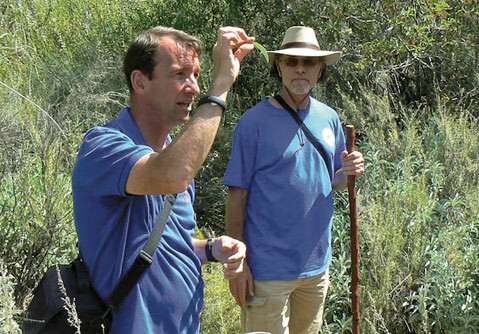 <b>NATURE CURE:</b> USC's James Adams leads a walk along San Antonio Creek this weekend. What if, instead of opening the medicine cabinet and popping some pills, you took a walk in the woods to find a cure for your woes? James Adams believes such a world is not only possible but also preferable, and the University of Southern California professor and Chumash-trained healer is using pharmaceutical science to prove the benefits that California native plants provide. He leads a walk on San Antonio Creek Trail with HerbWalks.com’s Lanny Kaufer on May 16, 9 a.m.-1 p.m., for $35. Adams answered some questions about his work and how he straddles the divide between native and Western medicine. How did you start on this path? My family came to this country in 1635. My ancestor was William Adams, who was a surgeon. His job was to keep the Puritan community in Virginia alive, so he learned from the Indians. He couldn’t wait around for the boat with the medical supplies to come from England. Ever since then, my family has used American Indian healing. The American Indians kept us alive. Most of my medicine was American Indian healing as a kid. When I got my degree in pharmacology, I looked around for an Indian to teach me how to use the local plants as medicine. I did a whole bunch of reading, and then I discovered that virtually all of the American Indians I talked to didn’t know as much as I did. Finally, I found one woman who really knew a lot, and Cecilia Garcia agreed to become my teacher. How did you become a healer? I’m doing this because I had 14 years of training from Cecilia and, when she walked on, the chief of the Chumash people, Ted Garcia, asked me to pick up her burden. I was really reluctant because I am a white man, but I am the holder of the knowledge. So after extensive introspection, I decided he was right, and I had to become a healer. Was it hard to be accepted by Native Americans? Oh, of course. I have no Indian blood in me. There is some acceptance — it’s not total flat-out rejections. But there are American Indian groups who are openly hostile to me. This one Pueblo Indian in particular tried to get the Sheriff on me. Is it hard to straddle the worlds of pharmaceutical science and medicinal plants? Pharmacology, in my opinion, is the study of plant medicine, because 75 percent of all prescription drugs come from plants and natural sources. But it is hard for me to do what I’m doing because I can’t get any funding, because the sources are not interested in American Indian healing or plant medicines. Why isn’t the pharmaceutical industry supportive? Plant medicines are hard to patent. They want to support drugs that are chemically synthesized because they are easier to patent. It’s a long struggle because most of the plant-derived medicines are actually mixtures of many things that each have pharmacological activity, but the pharmaceutical industry just wants to pick one, and say that this compound is responsible for this activity. With some plants, you can do that, but with many plants, it’s just not possible. So you use science to explain the plant medicine? That’s the idea. I go out in the hills and find the plants that haven’t been investigated. No one knows the chemistry of these plants. There are hundreds of them. I bring them back to the lab and find out what’s in them. There’s enough known about the phytochemistry of Chinese plants so that once I find out the phytochemistry of California plants, I can quickly find out what the pharmacology of the plant is and relate that to the traditional uses. Do traditional cures hold up to modern science? Yes, of course. What are some standouts? California sagebrush is number one. It’s a very potent pain reliever that we really need to learn how to use. If we can start using some of the native pain relievers, we can save tens of thousands of lives in this country every year. We can prevent ulcers induced by all of these oral medications that we use against pain. There’s an awful lot we can do if we just open our interest in California plants and traditional healing. Mugwort is another extremely useful plant that we need to learn how to use again. It’s used extensively in China, and it’s also used in Europe. It’s used for PMS and menopause, and it’s also used for dreaming. There’s so many people in our society who are depressed and can’t dream and therefore are in real trouble because they’re out of balance. What do your students think of this? They tend to be more reluctant because there’s always that fear that they could get in trouble for doing something that’s not fully FDA-approved. There’s a lot of fear. It’s kind of sad, but that’s life. Is USC supportive? The school is surprisingly supportive. I’m the main one who teaches plant-derived and alternative medicine, which the pharmacy students are required to take. That’s good for me. But it’s extremely difficult since I can’t get any funding to work on these things. There is an awful lot of pressure on me to stop doing this and go back to making genetically modified mice and things like that so I can get some funding. Isn’t there some other nontraditional funding source that would be interested? I’ve been looking for years and years now. I don’t know of any. Funding continues to be a major setback for me. But it could make things a lot safer for everybody.